The edition of « What is it for ? 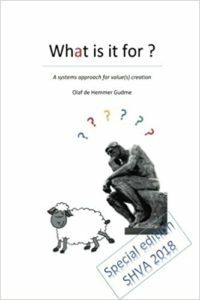 a system approach for value(s) creation », translation to English of the book « A quoi ça sert? 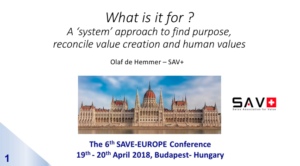 » has been possible, thanks to the deadline put by Istvan Tarjani for the deadline he put on organizing the 6th SAVE-Europe Conference in Budapest last week. How can the economy generate either more value creation and more respect for values? How can we do more (good) for more (people) with less (resources)? The key question is « What is it for? « . Combined with 2 other key points of the Value(s) reasoning and with system modeling, it is of such a power for innovation and efficiency that one wonder why we use it so little? « What is it for? » leads to collective intelligence and common sense. It goes much further than Cartesian thinking by implementing System thinking. Our utopia: in times of disruption and innovation, allow each transformation manager and each team to use Value(s) thinking to achieve his objectives and contribute to value(s) creation. A company with more value(s) in management ! The book « What is it for ? a system approach for value(s) creation » has been published in paperback on Amazon and the ebook offered to each participant to the Budapest conference.